Just a word of warning, this dish has several different components with varying cook times. I usually make everything at once, but that requires serious multi-tasking and a second pair of hands. Instead, I recommend following the order below. The sauce will retain its heat well, and you can always quickly reheat it if it’s too cold. Let’s start with the sauce. Place the butter in a sauce pan (You don’t need a pot, but you will want a pan that’s about 3 inches deep). Cook the butter until it begins to bubble, then add the flour and whisk rapidly to incorporate. Allow the butter-flour mixture to cook while you whisk, it will start to get lighter in color. After whisking for about 2 minutes, add the milk. Be careful not to burn the butter or the milk during this process. 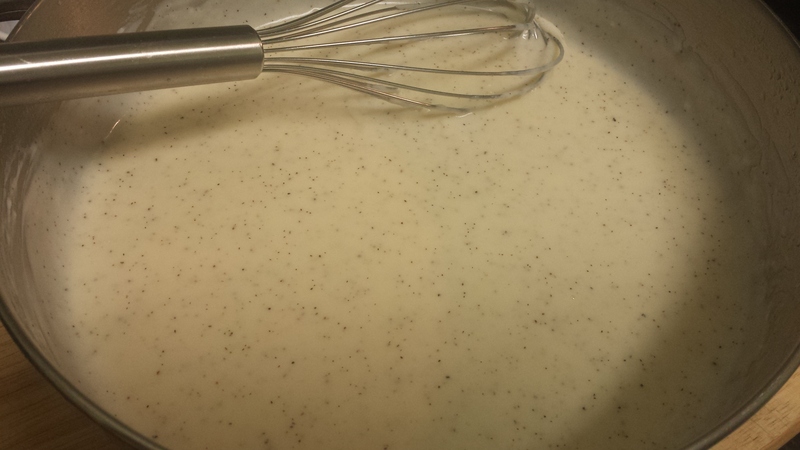 Continue whisking the milk; the mixture will slowly begin to thicken. Add the salt and pepper and stir continuously until the mixture becomes the consistency you prefer. I like my Alfredo a bit thick, so this usually takes about 10 minutes. When it’s ready, set the sauce aside and start on cooking the vegetables. Preheat your oven to 400 degrees. 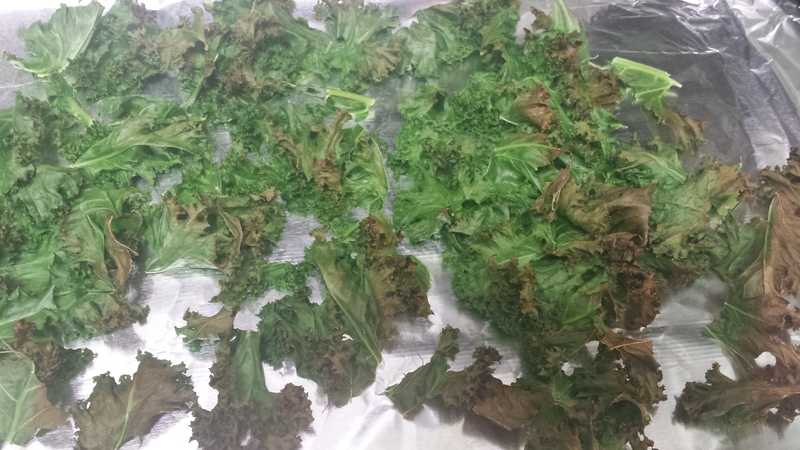 Spread the kale in a thin layer on a cookie sheet. Bake for 5 minutes; it’s ready when the kale starts to brown and is wilted. Remove from oven and set aside. Bring a large pot of water to boil. 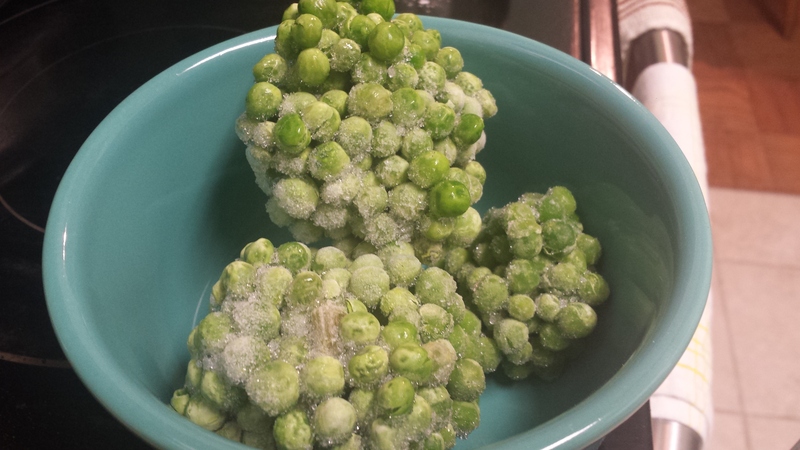 Add the peas and cook for 15 minutes. Taste test to make sure they are cooked to your liking, drain, and set aside. Bring a pot of water to boil. Season with 1 tbsp salt and 1 tbsp olive oil. Follow the instructions on the box, cooking time will vary for different types of pasta. 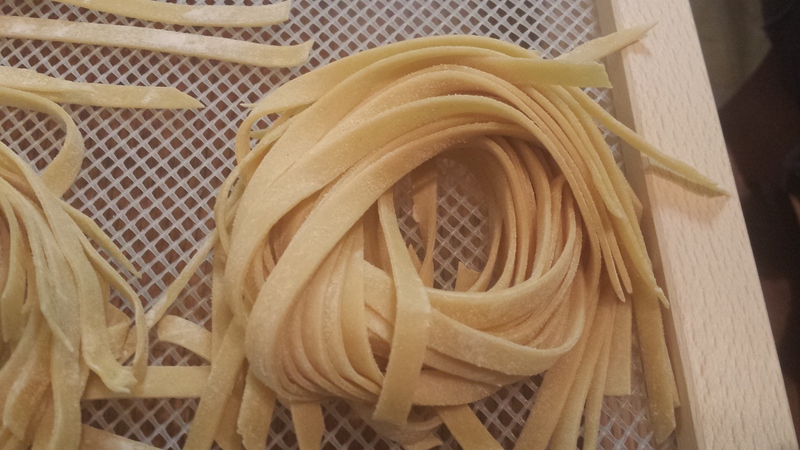 Below is my homemade tagliatelle; it takes about 3 minutes to cook. 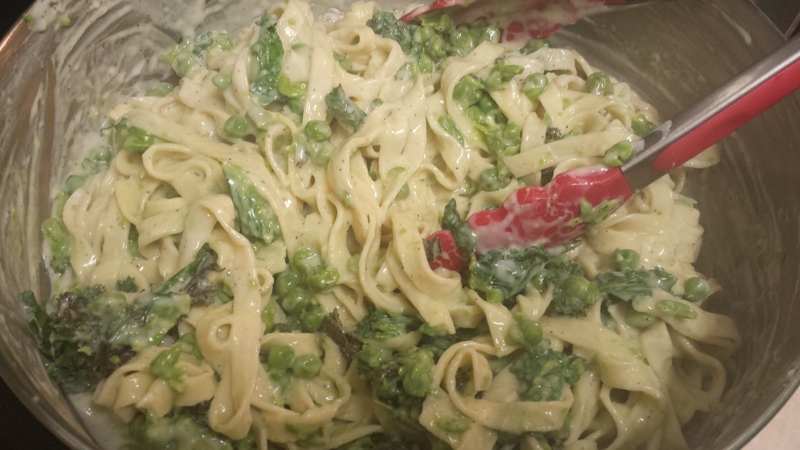 Finally, put the kale, freshly cooked pasta, peas, and cream sauce together and mix. Serve immediately with some red pepper flakes sprinkled on top. Yum.